Constituents: carvone (30 to 40%), limonene (30 to 40%), phellandrene (10 to 20%) and other monoterpenes. Dill is such a familiar and unique taste that one whiff of freshly picked dill makes your mouth water. Like cilantro, both the leaves weed (dill weed) and seeds can be used for seasoning, and both have the same medicinal properties. Dill is carminative, it eases gas pains, bloating and settles the stomach. Formulas for classic gripe water include seeds of dill, caraway and anise, as well as baking soda and a small amount of alcohol. Nursing moms may want to drink dill tea to increase breast milk, and those women who have a late or scanty period can drink a cup or two to bring on a period. Preparation Methods & Dosage :Use fresh dill weed for seasoning whenever you have it on hand the flavor is much more nuanced than when dried. Dill seeds are used as a cooking spice, in dill teas, and of course dill pickles. Dill vinegar is made by soaking the seeds in vinegar for a few days. Use 2 teaspoons of bruised seeds per cup of water to make dill tea to soothe an upset stomach. A few drops of dill oil in water, gripe water, is a old remedy for colicky babies. You can also dilute a drop of dill in a tablespoon of carrier oil to gently massage your baby's stomach and lower back. 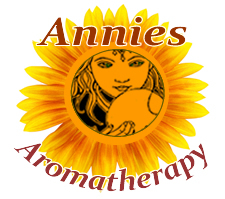 Dill essential oil is very similar to caraway oil, both consist mainly of limonene and carvone. 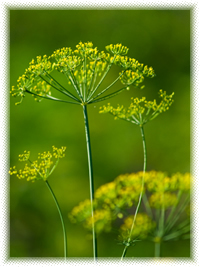 Dill oil is extracted from the leaves, stems and seeds of the plant and has a clear, spicy, dill scent. In the Kitchen: Dill is a unique plant in that both its leaves (dill weed) and seeds are used as a seasoning. Use the fresh, feather-like leaves to season eggs, fish, dressings, sauces and salads. Flower heads are used for pickling, often used for dill pickles. Just smelling the plant can make your mouth water! Dill Side Effects: Pregnant women can eat those dill pickles they crave in moderate amounts, but should not use dill in highly concentrated, or medicinal doses - it contains a compound, apiole, that is a powerful emmenagogue. Distribution:Native of the Mediterranean region, cultivated throughout the temperate zones. Dill is easy to grow, you do have to show patience for the tiny, intensely green seedlings to show up. Sow from seed in the early summer, as soon as possible in your area. Dill does not take to transplanting at all. Dill is a graceful, striking plant that grows up to 3 ft in height, with feathery leaves and flat umbels of aromatic yellow flowers, very much like fennel, until you smell it. Just smelling the plant can make your mouth water! It is a hardy annual that will sometimes self seed if left undisturbed, (my favorite way to propagate it). Prefers well drained, slightly acidic soil, and full sun. Plant will reach heights of 3 ft. Harvest seeds when flower heads are mature and starting to brown. Take care in handling to prevent seed loss. Hang in a brown paper bag to catch seeds as they dry, store in airtight canisters. Man has made use of dill since the dawn of time; there is evidence of its cultivation beside Neolithic settlements. The Egyptians and the Scythians both used dill in rituals for the dead. The Christian Monks of the old world believed it would keep the devil at bay, at the same time dill weed had a reputation as being an ingredient in witches brews. 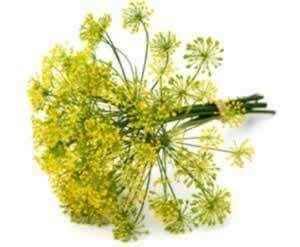 Dill was also an important herb to the pagans, and later became one of the herbs dedicated to Mary. That hindereth Witches of their Will. James Duke. "The Green Pharmacy Herbal Handbook" Rodale Books, (2000) The compound apiole in dill is such a powerful emmenagogue that most herbalists warn pregnant women not to use it in medicinal concentrations. Weiss, Gaea and Shandor. "Healing Herbs, The" Rodale, (1985) Dill leaves and seeds are used to increase mother's milk, and treat breast congestion, which may come with nursing. A simple tea of dill seed or weed may be taken several times a day.